One of the most complex parts of a school facility to design and properly maintain is an indoor swimming pool, or natatorium. When another area of a school is not in use, such as an academic wing, the lights can be turned down and the heating or cooling system lowered to save energy. But this option isn’t available for natatoriums, at least when they’re filled with water. To keep pool facilities efficient and comfortable for their users, they require careful planning and design. Moisture is the key challenge with an indoor pool. If there’s too much moisture in the air, swimmers and spectators will be uncomfortable, but more importantly, condensation on surfaces and window panes can cause them to deteriorate quickly. Temperature differences between the pool water and air will cause this moisture to migrate, which degrades finishes and causes mold and mildew to form. Keeping the temperature difference to 2 degrees (air warmer than pool water) is essential in limiting the amount of evaporation from the pool surface and moisture in the air. The presence of moisture on surfaces can present a hygienic issue in a pool environment, where people are barefoot and have portions of their bodies exposed. Keeping moisture down is handled by mechanical dehumidification, often in conjunction with air conditioning. 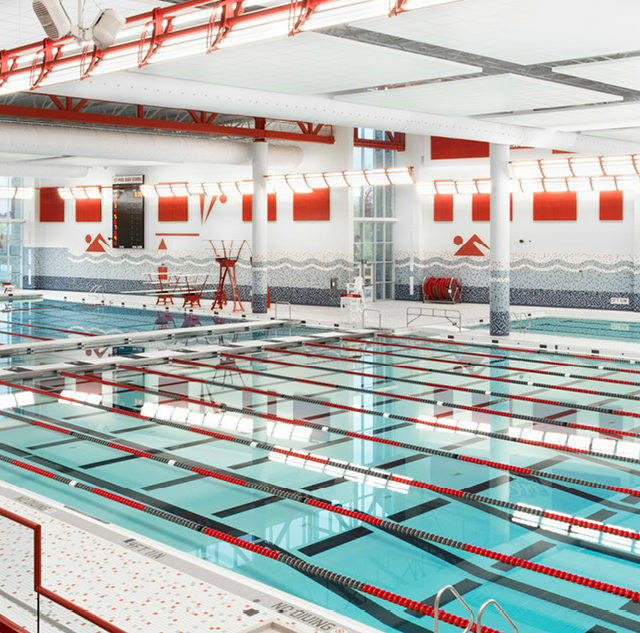 Since the mechanical reaction of moisture transferring into the air causes heat, natatorium designers seek to find ways to take that heat and transfer it somewhere where it can be useful. A common choice is to use this energy to heat the pool, but the most effective option is to preheat the air used in ventilating the pool area throughout the year. Natatorium designs also have to allow for plenty of ventilation of fresh air into the space, especially during competition days when the facility has many times the number of people it normally does. Lighting is another special challenge for school pool facilities. The most important aspect of pool lighting design is reducing glare on the water. Lighting should be placed over the deck (not over the water) so that fixtures can be maintained easily. Glare can make it difficult for people outside of the water to see below the surface, thus rendering it a safety concern. Good natatoriums use diffuse light systems, with the light bounced off walls or ceilings to create clear light without shadows or glare. And because swimmers need to see the markers on the edges of the pool to keep them on target, the strength of the lights’ vertical foot candles (the amount of light that lands on a vertical surface such as a wall) is important. Natatoriums can also make good use of natural light during daylight hours through glazing. In ideal conditions, as much as 50 to 70 percent of the light needed can be provided through natural sources. To do this, windows should be placed in conjunction with the HVAC system to blow air on the glass to prevent condensation from forming. Large windows are an efficient way to light your pool. 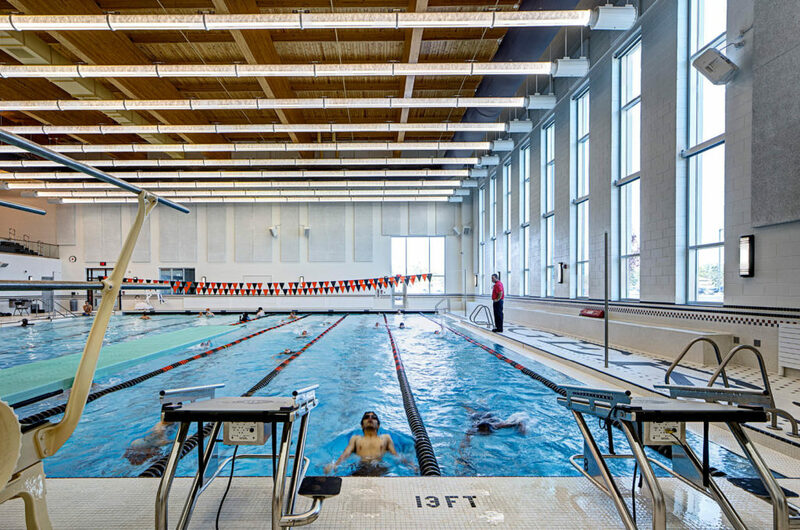 The best way to reduce energy usage in a natatorium is with a flexible, easy-to-use control system that allows for the lights to be raised and dimmed, often with the touch of a button. While a great amount of light is necessary during competitions, it would generally be turned much lower for practices or off-hours. LED bulbs are the standard due to their low energy usage, low heat generation and long life. Indoor pools can be a very loud environment, which is an issue both for the comfort of the occupants as well as the safety of swimmers, who need to hear instructions or warnings from a coach or lifeguard. Because these facilities contain a lot of non-porous hard surfaces, sound tends to bounce and echo around the interior. Sound-deadening materials on the walls and ceilings help to mitigate this by breaking up the flat planes. A mix of hard and absorptive surfaces will result in a quieter, less echoed natatorium. At Fanning Howey, we often work with specialized sound consultants to determine the best design for natatorium acoustics. While indoor pools are more complex to design and maintain than a classroom or media center, with the right approach, your natatorium can be a safe, efficient and comfortable space for swimmers and spectators alike.